Jeremy Ellis (left), Dionel Harris (center) and Devon Swan (right) are charged with murder in the shooting that killed 2-year-old Lavontay White. CHICAGO (WLS) -- Two more men have been charged in a shooting that killed two people, including a toddler, in the North Lawndale neighborhood last week. 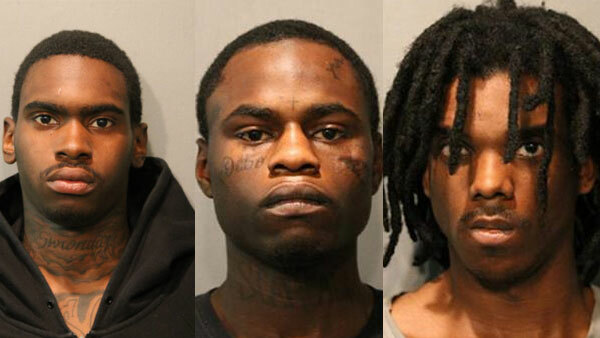 Chicago police have charged Dionel Harris, 19, and Jeremy Ellis, 19, in the shooting that killed 2-year-old Lavontay White and 26-year-old Lazaric Collins in the 2300-block of South Kenneth Avenue on Valentine's Day. A pregnant woman was also wounded in the shooting. Harris is charged with one felony count of first degree murder. Ellis is charged with two felony counts of first degree murder and one felony count of attempted murder. Swan is also charged with first degree murder and attempted murder. Chicago Police Superintendent Eddie Johnson said at a news conference Friday afternoon that one additional person had been arrested in connection with the shooting, but did not elaborate on what their involvement may have been. That individual has not yet been charged with anything. On Saturday, Devon Swan, 26, was charged with murder in the same shooting. Community leaders offered a $10,500 reward for information leading to a suspect in the shooting. The toddler is one of three children who died last week after being shot.